Story by: SPC Edward Shevlin, - New York Guard. Members of the 88th Brigade, New York Guard, at Cavalry Cemetery in Queens, NY. One hundred and fifty-four years after the fateful Civil War battle at Marye’s Heights, near Fredericksburg Virginia, the 88th Brigade of the New York Guard held their annual Commemoration of the Battle of Fredericksburg on 10 December 2016, at the Irish Brigade Monument in Calvary Cemetery, Queens, New York. The Veteran Corps of Artillery, a long time supporter of the 88th Brigade in commemorating the Battle of Fredericksburg, once again played an essential role in honoring those who gave their greatest effort and those who gave their lives to the cause of freedom on 13 December, 1862. Above: Members of the Veteran Corps of Artillery, dressed as Union Soldiers, at Cavalry Cemetery. On the day that the Irish Brigade of the Union Army joined the Order of Battle at Fredericksburg, they, like many of the other units of the Union Army were both battle-hardened and somewhat fatigued, having fought valiantly in the Peninsular Campaign in July of 1862 where after one particularly brutal engagement, Brigadier Thomas Francis Meagher had this to say in his report to General E.V. Sumner, 2nd Corps Commander, “In the mean while the Eighty-eighth were thrown forward to the left of the Sixty-ninth, and their rapid and impetuous movement had the effect of outflanking the enemy and perfecting the success which the Sixty-ninth had already to so important an extent achieved. The oblique line thus formed by these two regiments was maintained with decisive resolution until the enemy fell back from the range of fire.” Following this series of battles on the Virginia Peninsula, the Irish Brigade found themselves embroiled in the Battle of Antietam in September (where the 88th took 104 casualties from their original 302) of that year, where they were once again distinguished by their bravery and discipline. So fiercely had they fought between July and September of 1862, that their green battle flags had to be sent back to New York City to be repaired as they were in complete tatters and thus, unrecognizable. The flags were promised for return to the brigade on 15 December 1862. With their beloved green banners still two days from delivery, BG Thomas Francis Meagher ordered that all members of the brigade should place a sprig of boxwood on their covers before marching into battle to distinguish them from other Union soldiers. Another feature which was unique to the Irish Brigade was that of their weaponry, the Irish Brigade carried the U.S. Musket 1842, a smoothbore .69 caliber weapon which they loaded with buck and ball, a cartridge consisting of one .69 caliber ball, accompanied by three smaller balls, which essentially turned this musket into a shotgun, a devastating weapon at close range. Above: Members of the 88th Brigade, New York Guard, are joined by the Veteran Corps of Artillery at Cavalry Cemetery in Queens, NY. Thus equipped the Irish Brigade began their march towards Marye’s Heights, bristling with Confederate Artillery and well-entrenched infantry. The newest regiment of the Irish Brigade, the 116th Pennsylvania Volunteers marched to the left of the 88th with the 69th to the right of the 88th. The 63rd New York and the 28th Massachusetts, with their battle flag still intact, filled out the right flank of the formation respectively. With nearly a mile of open ground to cover on their advance upon the Confederate positions atop the hill, General Meagher’s boys began trotting towards their foes. Unwavering in the face of withering fire from the enemy, the Irish Brigade needed to get very close to the enemy works in order to bring their smoothbore muskets to bear, and thus began a brisk double-time up the slope. With airbursts of artillery shells above them and fusillades of rifled muskets before them, the fog of war or, copious amounts of gun smoke, obscured somewhat their position upon the battlefield, allowing them to continue their advance towards the enemy positions, which were manned by none other than “Cobb’s Legion”, a regiment of the Confederate Irish Brigade hailing from Georgia. Pushing to within fifty yards of the Confederate position the Union soldiers were repelled to the cheers of their fellow Irishmen behind the wall at the top of the hill. However, these were not the cheers with which one taunts an opponent, but cheers in salute of a fellow soldier’s bravery. Their attack having been repulsed, the Irish Brigade made their way back to their lines to lick their wounds and tally their losses. The Georgians had cut the Irishmen to pieces. Of the approximately 1,400 men who started up the hill, 545 became casualties. Because such bravery and commitment must never be forgotten, members of the New York Guard gather each year to salute their forebears, the soldiers of the US Army’s Irish Brigade at the monument dedicated in their name in Calvary Cemetery here in New York City. 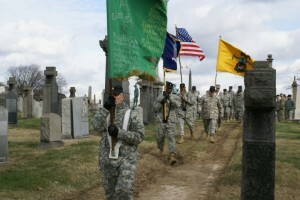 This year’s ceremonies of 10 December 2016 began with a Mass of Remembrance in the cemetery’s chapel, followed by a parade to the Irish Brigade Monument from the chapel which was led by bagpipers and drummers from the 88th BDE and the VCA with an assist from Pipe Major Emeritus John McManus of the County Tyrone Pipe and Drum Band. Above: Members of the 88th Brigade, New York Guard, at Cavalry Cemetery in Queens, NY. Upon arriving at the monument, wreaths were placed by COL. George DeSimone, Acting Commander of the New York Guard, COL. Whalen, Commanding VCA, and LTC. Raymond Lamboy, Commander of the 88th BDE. With all standing at attention, the Ceremonial Firing Squad of the VCA fired salutes, after which the Bugler played Taps. Refreshments followed at the Bantry Bay Tavern shortly after the conclusion of the event. The testimonies of soldiers from both sides of the Battle of Fredericksburg bear out the truth of this statement.